While the lakes and their natural resources have contributed to building both nations and their economies, this progress has exacted a high cost in some locations around the Great Lakes. Legacy and ongoing pollution from industries, mining, ineffective water treatment, agriculture and other water uses have resulted in fish that cannot be safely eaten due to contamination by persistent toxic substances – pollutants that come from many sources and can damage the health of all species because they remain in the environment for a long time. Water may require extra treatment to address taste, odor and potential health problems, and beaches may not be safe for recreation because of high levels of bacteria or other contamination. 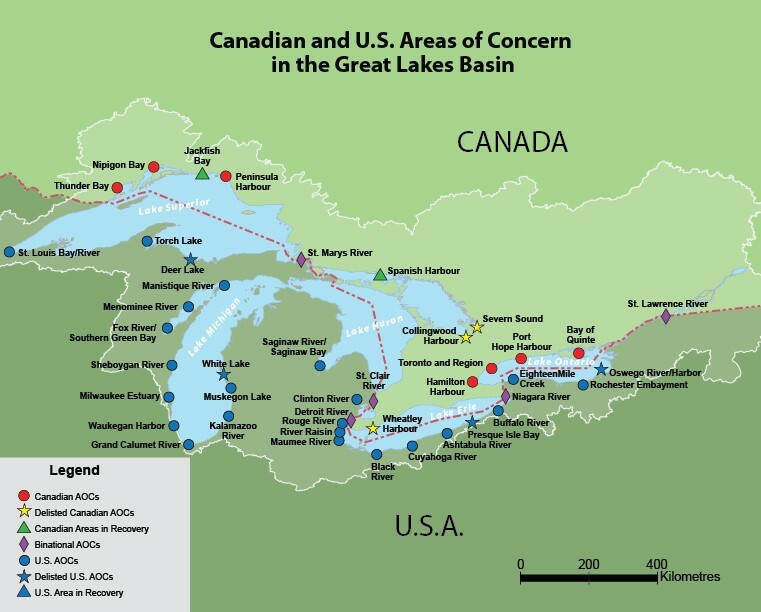 The 1987 Great Lakes Water Quality Agreement established 43 of the most polluted locations as Areas of Concern: 26 in the United States, 12 in Canada, and five binational and thus shared between both countries. Restoring these areas is dependent on how the water and surrounding land are degraded and what uses people can’t enjoy because of the pollution and degradation, which are identified as beneficial use impairments or BUIs. For each Area of Concern, the two federal governments, states and provinces develop Remedial Action Plans or RAPs that outline BUIs and their causes, actions needed to restore the area, agencies and organizations responsible for these actions and the timeline to complete them, criteria to measure that all BUIs have been restored, and when the area can be taken off the list. Using the Great Lakes Water Quality Agreement’s ecosystem approach is also mandated, which accounts for interrelationships among air, water, land and all living things and involves all users and responsible agencies in the area’s management. The process to clean up Areas of Concern has proven difficult and expensive, and so far has spanned more than three decades. Seven areas have been delisted and two have been designated as in recovery. Both countries have committed billions of dollars and created extensive local and regional partnerships to develop and implement each Area of Concern’s RAP. The 2012 agreement outlines a multi-step process to create and implement RAPs based on these decades of experience, and funding provided by the federal governments, states and provinces continues to ensure that BUIs in each Area of Concern are restored. The IJC reports on progress for each Area of Concern in its triennial assessment reports. Detailed information on BUIs, delisting criteria and agency links can be found here. A key lesson learned is that the more the local community’s residents, governments and leaders are involved, the more success they will have in developing and funding an effective plan that will reap the benefits desired. Public advisory committees, councils and other groups are essential, especially in binational locations where multiple communities are involved. Do you live near an Area of Concern? You can play a key role in helping to identify and remove BUIs and thus restoring your part of the Great Lakes. Find your agencies responsible for cleanup efforts in each state and province, and connect to YouTube to view a video that summarizes work completed thus far in several Areas of Concern.